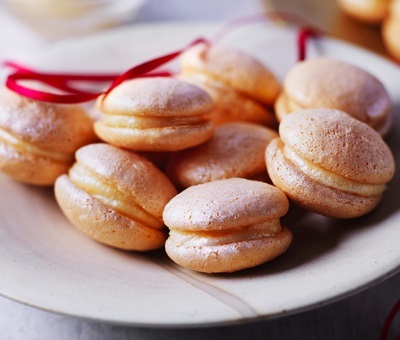 Bake these heavenly clementine macaroons great as a beautiful centrepiece at a dinner party. They taste as good as they look. Preheat the oven to 170°C (150°C with fan) Gas mark 4 1/2. Beat the whites with an electric hand whisk to stiff peaks. Add caster sugar and the orange colouring and whisk again till it forms a glossy meringue. Sieve in the ground almonds and icing sugar into the meringue, fold until the mixture is pourable but thick enough to pipe. Spoon the mixture into a large piping bag. Pipe small circles onto the lined baking sheet (approx. 2cm diameter). Leave to rest for 15 minutes then place in the centre of the oven and bake for 10-12 minutes till slightly golden on top. Remove from the oven and leave to cool, then lift carefully from the sheet, they should unstick easily if cooked throughout. For the filling mix the cornflour with 2 tbsp of the citrus juice. Place the Carnation condensed milk, cornflour mixture, zest and egg yolks together in a microwavable bowl, stir well and place in a microwave for 1 minute at a time, whisking in between until thick, this will take about 6 minutes. (Alternatively place in a pan and whisk continually over a low heat until thick). Allow to cool. Pair the macaroons with others of similar size then use a layer of the filling to glue them together. Spray lightly with glitter spray. Pop the macaroons into a pretty box and they make a delicious gift.